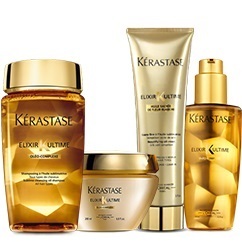 Since 1964, Kérastase has been creating advanced new hair care services founded on their original super-formulas, and subsequent research on their best performing products. Escape into a world of innovation, exclusivity, indulgence and elegance with Kérastase. Since its creation, Recherche Avancée L'OREAL has selected its most advanced technology for the Kérastase Collection. Kérastase products are innovative, include advanced ingredients, unique formulas and are products that women aspire to. To care for and enhance the natural beauty of women hair. Whether it needs radiance, nourishment, damage repair or a combination, our experts will design a treatment that is bespoke to your requirements. Indulge in ultimate pleasure and relaxation whilst Kérastase enhances the natural beauty of your hair. That complete personalized diagnosis service includes not only analysis of hair and scalp but also development of individual program of hair treatment based on specific client’s needs. That Kérastase program will guarantee improvement in your hair and scalp condition. Diagnostic camera is an innovative hi-tech device, which helps to make a very precise analysis via colorful photography of your hair fiber and scalp. Using professional evaluation methods and very detailed photos, our qualified Kérastase Ambassador will develop the most appropriate program to improve your hair and scalp condition. 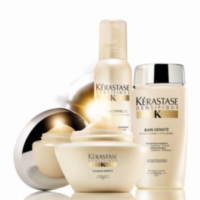 Kérastase first system of concentrated active ingredients freshly fused by the hairdresser. Made-to-measure and created for you. Your hair looks and feels instantly replenished as if transformed. Exclusively performed in Kérastase Salons. Your hairdresser identifies the primary AND secondary needs of your hair then selects the appropriate combination of Fusio-Dose. 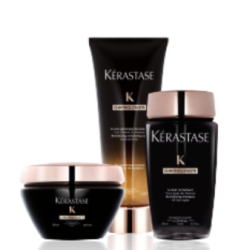 Buy professional products Kérastase Densifique on-line. New Offer! Get 15% back on every purchase above 1 000 CZK! If you are not sure what's the best for you, you can book a free consultation with our specialist.